Paper-piecing is not something that I really enjoy; however, I have a lot of small scraps and hate to throw them away. This afternoon, I used some of those scraps to make four 6 1/2 inch, scrappy heart blocks. I don't know what I'll do with them or how many I will make, but I know I'll make more. Coping with a chronic illness on a physical level is challenging, however, coping daily with the emotional and spiritual struggles that accompany chronic illnesses can be even more difficult. To truly understand these obstacles, you have to experience it. 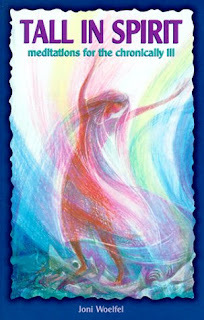 That is why I have enjoyed reading and re-reading Tall in Spirit: meditations for the chronically ill by Joni Woelfel. Excerpts of Tall in Spirit can be read online. The book includes 40 meditations, each with a scripture and a prayer. Ms. Woelfel knows; she understands, and she speaks the language of one who has struggled with a long-term illness (Menier's disease, Bell's palsy, and other diseases). Because of these illnesses, she struggles with remaining active, finding peace with shattered dreams and harsh realities, and coping with painful emotions. Tall in Spirit was her first book, and she has since written others. I am anxious to read all of them, but I am drawn to her fifth book, Party of One: meditations for those who live alone. Stash reduction has been an on-going goal of mine, and I have been working on it for the last two weeks. Evenings I usually knit seven-inch squares for the All Crafts for Charity February and March project. The short-cuff socks were knit during my shift at the hospital, at the car dealership while my car was being serviced, and at knitting night. Wednesday and Thursday, I used some flannel scraps to make a baby blanket. I have another pair of short-cuffed socks on the needles and another baggie of yarn ready for yet another pair. When I finish these two pair of socks, the scrap sock yarn bag will finally be empty. The most beautiful headstone I saw at Mount Hope Cemetery was not even engraved. I assume it will be carved after the individual dies. 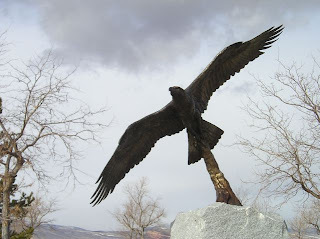 The marker, which stands at least twelve feet, is a true work of art in the new section of the cemetery. I find cemeteries interesting, and I frequently stop and wander through them, taking photos. Yesterday, I was in Lander to have my car serviced, and I found myself drawn to the cemetery overlooking the town. (Every other time I was there, I did not have my camera.) 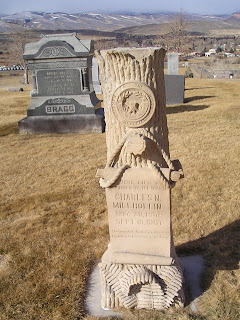 Yesterday, I wanted to take some photos of the unique headstones, shaped like tree stumps. 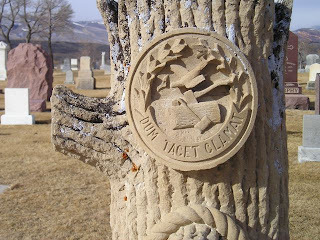 I always thought the headstones were those of lumber jacks, but they are not. 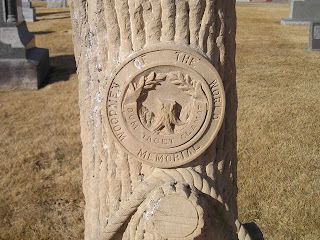 They are markers for members of the Woodmen of the World. I tried to find some information at the Pioneer Museum, but it was not open. I went to the Lander Public Library, but it is closed for renovation. I was able to speak to the curator of the Riverton Museum who told me the Woodmen of the World was a fraternal organization. The curator thought most people joined in the early 1900s for insurance. When I got home, I checked online. According to Wikkipedia, the organization is still active and has over 800,000 members, nationwide. History of the Woodmen of the World organization can be found on its website. Even though these headstones are unique in my area, they are scattered throughout the United States. 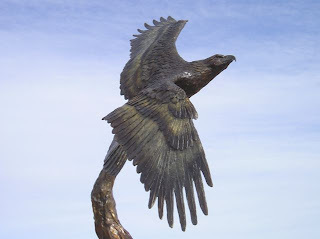 Some awesome photos of the diverse works of art can be found here. 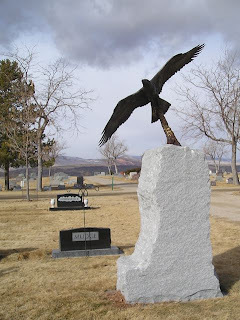 Do you have any of these unique headstones in your area? Kaniger from Ravelry added a crochet border to Creamsicle. Her border transformed the little Oddball into a real beauty. Thank you Kaniger! Outside My Window. . . or rather the window at the front desk of the hospital I saw a harbinger of Spring, a man mowing the large soccer practice field at the high school. Billows of dust followed him as he made his way back and forth. Personally, I think it is too early to think about doing any yard work; however, maybe the man has an informant. 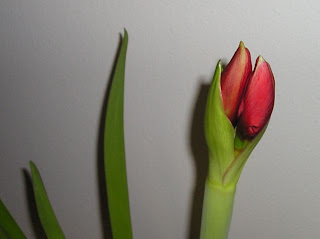 I hope so: I am weary of winter and its lack of bright color. I am thinking. 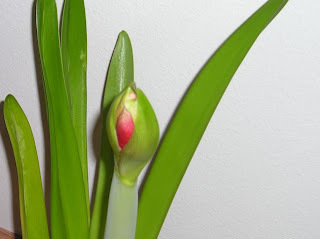 . . of spring in my own way. Over the weekend, I grubbed out the small room that contains all of my craft supplies. I removed the twin bed and trundle and moved it into the room down the hall. I had the daybed removed from that room and hope to sell it at the yard sale this spring. Two of the twin mattresses were picked up yesterday by a woman who responded to my Freecycle offer. Now, that I have a true "sewing room" I hope to get some new projects started. I am thankful... for so many things in my life. The Lord has given me so many blessings, more than I will ever deserve. In the kitchen... I have the ingredients for making bread in a bag. I have wanted to try this method for a long time, but I never got around to it. I plan on making some of the bread tomorrow afternoon. I am wearing... a pink tee and black pants and my ever-present support stockings. I am creating... knit squares for an All Crafts for Charity project and more socks out of scrap sock yarn. I am planning... to get serious about reducing my fabric and yarn stash in the coming months. I am praying... for healing for Deb, Leslie, Shelley, Fran, and Dianna. I am hearing... the birds chattering in the lilac bush. They use the bush for cover from prowling cats and hovering hawks. Winter is a silent time: the birds are conserving their energy to just survive. I never notice it until the birds become more vocal in the warming days. One of my favorite things... a giant pinwheel that I put in my yard every year. I remember what a treat it was when my mother would buy a pinwheel for me. On the way home (a 30-mile drive) I would turn the small vent window (remember those?) and delight in the spinning pinwheel. A Few Plans For The Rest Of The Week. . . a) health talk at the hospital tonight, b) oil change for my car, and c) doctor's appointment. A quote worth sharing. . . Sometimes, we must go where no one else will go. Knitting on Oddball Baby Blankets is a lot of fun, but knitting only one section and sending the blanket to the next knitter makes it difficult to visualize the finished item. The satisfaction of helping is limited to that one section, especially if you are one of the beginning knitters. 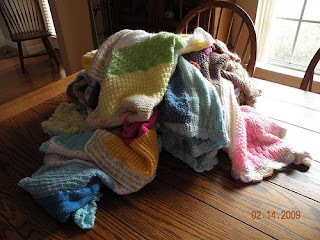 The West Coast Oddball Knitters are a productive group with seventeen blankets completely finished and at least fourteen more in various stages of completion. Recently, the group coordinator prepared the blankets for delivery. 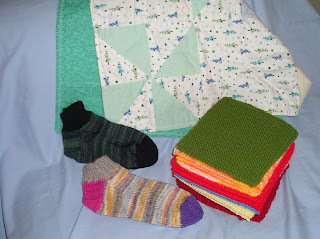 She laundered and sorted the blankets, matching each with the cards that accompany the blankets. Each knitter signs the card before mailing the blanket to the next knitter, and the card and blanket are given to the baby's parents. preemie-sized in another. The blankets will be donated to a hospital in our western region. It warms my heart to know that I have helped with this project. January and February were productive months for reading and listening to books, and as usual, I enjoyed some more than others. I highly recommend the books with four or five stars: they offer more than mere entertainment. Most of the books with three stars or less are considered classics and give a unique perspective of history or other cultures. I enjoyed the stories, but the writing style clearly reflects another era. The worst book I read was 1984. I found it tedious and felt that Orwell nearly bludgeoned his readers with his message. I understand why the novel is considered a classic, but I would never want to read it again.Here if You Need Me: A True Story was by far the best book I read. By the time I finished, I was sad to leave Kate Braestrup's company and would gladly spend time with this book again. Several readers have asked about the frame that I use for my rugs. My mother's frame was made from rough 1 x 3 boards. The rods were scrap metal rods from somewhere on the farm. I own three frames (other than my mother's), but I use only two of them: a plain Jane made from 1 x 2 boards and a fancy, adjustable one made from oak. The basic frame is easy to make, and the components are common to any lumber yard. The photos that may be helpful, but keep in mind these photos are of a small place mat frame. The larger frames are made the same way. 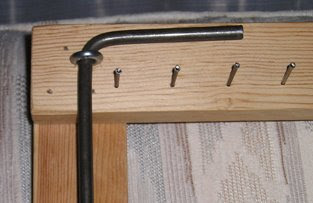 The rug frame has a series of finishing nails (26 on each end). The top and bottom boards are 27 inches wide. 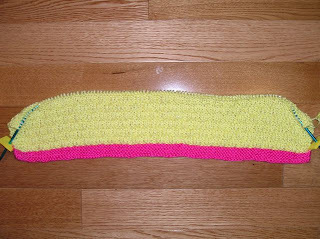 The sides are 39 inches long. (Lumber yards will cut boards to any length that you request) The nails are 1 inch apart, but the end nails are 1/2 inch from the metal rod and 1/2 inch from the inside edge of the boards, but 1 inch from the outside edge. Purchase and use the longest finishing nails you can find. The longer the nail the easier it is to start the rug and to avoid the warp from popping off of the nails. The rod (technically known as pencil rod by those who frequent Home Depot) is 1 inch from the side edge of the top and bottom pieces. The eyelet that holds the rod is 3/4 inch from the top and bottom of the frame. The rod is supported by eyelets along the side, too. The place mat frame has only three eyelets on the side, but the rug frame has five. Make sure that the screws on the eyelets are long enough to allow the rod to be level. 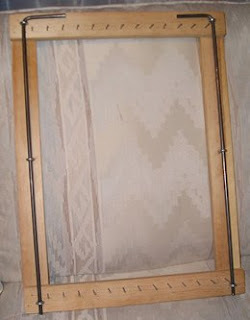 The place mat frame (shown in the photos as the empty frame) has a 15 inch board at the top and bottom, a 20 inch board on each side with 13 nails on each end (spaced 1 inch apart, but 1/2 inch from the rod and from the inside edge of the top and bottom board). Again the eyelets for the rods are 1 inch from the outside edge and 1/2 inch from the last nail. My frame, nor my mother’s frame, are fancy or finished wood. Actually, mom’s frame has crayon marks all over it. Hmmm, I wonder who could have done that? A few years ago, I saw an adjustable frame. The sides were routed out on the inside and a bar (with the nails) was tooled to fit inside. That bar slid up and down to change the size of the rug. The side boards had holes drilled strategically for nails to be pushed through and secure the nailed bar. I don’t know how well it would work. I dragged by brother-in-law into the store to see the frame and begged him to make one for me. The next Christmas, he presented me with an adjustable frame made from oak. He had created his own design, and it works very well. I can made a wide variety of lengths and widths on that frame. I call it my "Cadillac" frame. If you do not want to make your own frame, you can purchase one here. The book on this site Rugs from Rags by Country Threads is also helpful as it explains the technique of twining. It is a good book for someone who just wants to learn the twining process. The booklet includes instructions on how to make the rug frame. Bobbie Irwin's book Twined Rag Rugs gives more history of the technique and explains how to make different designs in the rugs as well as round twined rugs. I would recommend this book for those who are truly serious about making rugs. The book is filled with color photographs and feature stories of those who twine rugs. This book shows a variety of frames, but it does not give instructions on how to make them. It is informative and a good read. 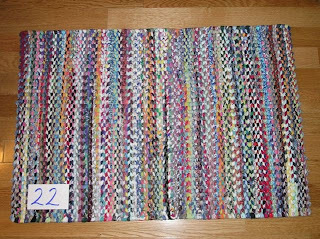 Fabulous Rag Rugs from Simple Frames by Diana Blake Gray offers even more of a variety of rugs to make on a basic frame. I haven't made any of the adaptations of the basic twined rug, but this book certainly tempts me when I look at it. The frame featured in this book does not have the side rods, but it is very similar. I am certain that I could use my frames to make the rugs discussed in this book. Creamsicle, another "not quite Oddball," will be sent to the West Coast Oddball group after a border is added. I knit this border on the blanket yesterday afternoon but frogged it because it just didn't look right: it didn't form the scallops. 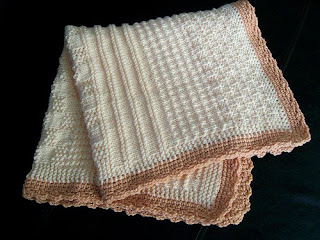 I wish that I could find a pattern for a knit edge that I could add to these blankets. Kaniger from Ravelry added the crochet border, and it really transformed this Oddball into a beauty. Isn't it beautiful! It was well worth the wait. Outside My Window. . . a beautiful day is unfolding. I just came in from getting the paper and hanging the flag for President's Day. The air is a crisp 20 degrees, yet the sky is nearly clear. It is becoming obvious that Winter is on its last legs. I am thinking. . . that I want to go back to bed because I spent so little time sleeping last night. This morning I am groggy, cranky, a headache is starting in the back of my head, and my ankles are already swollen. I went to bed at 10:30 and lay still for over an hour, trying to sleep. Yet, sleep did not come. I got up and knit until 1 PM. That did the trick, but when the alarm rang at 6:30 AM, I shut it off and slept for another 30 minutes. Staying in bed was not an option because Monday is my volunteer day. I will mumble and grumble for another 25 minutes and then start my day. Once at my post, I will be fine. I am thankful... that today is a holiday: the number of patients coming to the hospital for tests will probably be light. In the kitchen... my oatmeal bowl is soaking in the sink. Surprisingly, other than this bowl, my kitchen is clean this morning. I am creating... another baby blanket for the West Coast Oddballs. I am planning... to begin sewing at least twice a week. I have been neglecting my sewing machine for too long. I am praying... that the weather holds so support group members, and the meeting presenter have good roads on which to travel. I am hearing... the carpenters return to the garage they are building. One by one, the builders' trucks appear. Each man, clutches a cup of steaming liquid, probably coffee, and they congregate on the sunny side of the structure. Today, they will probably finish the roof, but for safety sake, they will wait until the sun has melted the frost that formed there last night. They use this time to warm their hands and to visit; they are planning their day on the this job. One of my favorite things... my old photo albums. When I look at the images inside, I can't help but smile at the good times that they captured. I am so glad that my camera was never far from my side in those days. My goal this year is to twine at least one rug a month. I finished #20 and #21 in January, so I really didn't have to work on one this month, but I started one last Wednesday. Yesterday, I took #22 off of the frame. It feels good to achieve my goal two consecutive months. I am still waiting. . . It is so close. "Home really is where the Heart is." My brother-in-law made these two shelves so I could display my collection of Maud Humphrey Bogart minis. 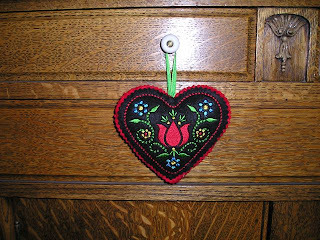 Hearts of all sorts can be found in the guest bathroom. My niece created the Precious Moments counted-cross stitch for me in 1982, a friend gave me the ceramic heart in the center. 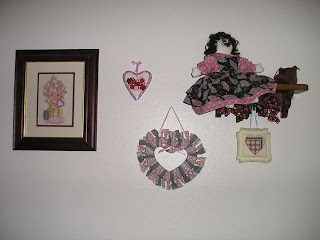 Several years ago, the pastor's wife made the fabric heart for me, My sister made the heart pillow, hanging from the shelf. My oldest sister made the pillow featured in the 2008 Pillow Talks. This ornament was given to me by one of my knitting buddies at the Christmas party. It looks so good on the antique buffet that I think I'll display it all year long. I am not sure what I expected when I grabbed Here If You Need Me: A True Story off of the library audio shelf, but the book is quite good. The audio version of this book was read by the author, and Kate Braestrup's voice and her words are nearly hypnotic. The reader (listener) is shown several sides of Kate - a loving wife and mother, a grieving widow, a compassionate friend and pastor, and a story teller. After her husband, a Maine state trooper, is killed in an automobile accident, she enters the seminary and becomes a Unitarian chaplain for the Maine Game and Fish Department. She counsels families of individuals who become lost or injured in the Maine wilderness and the wardens, themselves, as they deal with death nearly every day. The message of Here If You Need Me lingers with the readers/listeners and forces them to examine the times in their own lives when others have reached out in love. 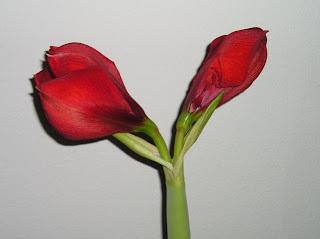 With any luck, this amaryllis is going to bloom on Valentine's Day. Every day it opens just a little bit more, and I keep turning it to make sure that it doesn't lean too far and break. 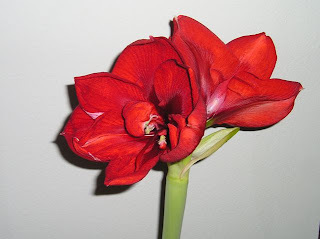 The amaryllis was a Christmas and Thank You gift from one of the young women in my knitting group. You may remember that I helped her knit socks for her husband. With winter dragging on, I am anxious to see a bit of living color in my house. 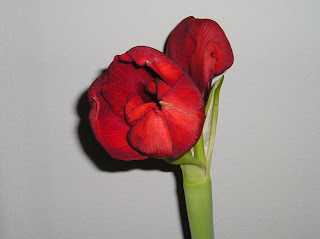 I really think this is going to be a Valentine's Day bloom. This afternoon, I loaded the frame and started another rug. 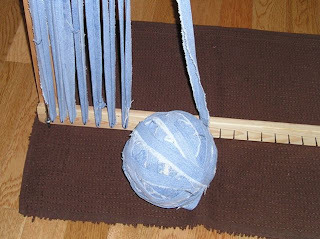 The ball of denim is about the size of a soccer ball, and I used most of it to load the frame. Two Oddball Baby Blankets demanded my attention this week. 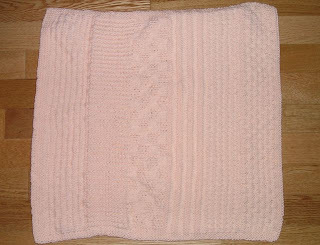 I used the Purled Ladder stitch for both of them, using Caron Simply Soft yarn. Flower Power certainly did brighten my day with its cheery colors. Jewel of the Nile was a bit frustrating. I had to frog it two times because a dropped stitch threw the stitch pattern off, then I ran out of the beige yarn eight inches short of the end of the blanket. 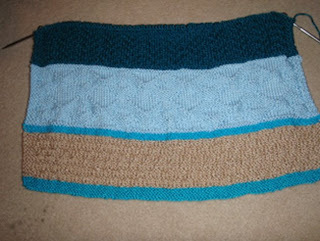 Fortunately, I had some turquoise yarn that is a close match to the garter edge that was on the needles when I received the blanket, so I frogged back and added two garter ridges. I never tire of knitting these little blankets. I have lived in this area all of ten years of my life. Of course, the scenery is beautiful and the climate generally good, but the real reason I stay is because of the people. It is a wonderful place to live because people truly do care about others. Do people in your community do the same things? Outside My Window. . . a light skiff of snow covers the ground, enough to allow cars to leave tracks, but not enough to bother getting off of the sidewalks. The sun, if it shines, will melt it quickly. I didn't think the sun would shine at all yesterday because it was so dreary in the morning, but by mid-afternoon patches of bright blue were visible. I am thinking. . . about finishing my tax information for the accountant. I have most of it finished; I just need to put it in a format for him. I hope one of these days to be able to do my own taxes again, but the tax laws are so complicated for my mind. I am thankful... for Jen. She keeps me on track with my Simple Woman's Daybook. Thanks, Jen for inquiring when I miss a daybook. In the kitchen... the table is an utter mess. I am working on the support group newsletter, and file folders, papers, and CDs are scattered over the entire table. I think I finished the issue last night, but I still need to proof read it at least one more time before I print it for distribution. I am wearing... my PJs. I am being very lazy this morning. As Melisa stated on her blog: I am "rough around the edges" this morning. The last week, I cannot seem to get enough sleep. I wake up tired and groggy, so today, I am going to be lazy. 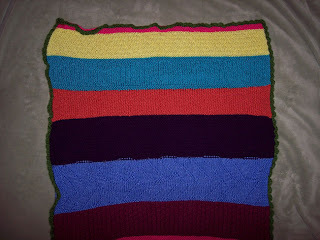 I am creating... another Oddball blanket. I received two new blankets in the mail yesterday from the West Coast Oddball coordinator. She cast on and knit the garter edge, so now I need to add my four-inch section before sending them on to the next knitter. It is good nighttime knitting. I am planning... to begin another rug this week. "Planning" is the operative word in that sentence. I am reading... Forever Odd by Dean Koontz and Here If You Need Me by Kate Braestrup. I just started both of them. I am praying... for myself this week and some things that have been on my mind. I need some direction from the Lord. Patience was never a quality that I possessed. I am hearing... the steady twack of hammers down the street. One of my neighbors is building a huge garage on a lot next to their house. One of my favorite things... an antique oak buffet that I refinished about twenty years ago. When my sister bought her first house, the buffet was in the basement. She did not want it, but stored it at my mother's. I asked if I could have it, and when she said, "Yes," I stripped the finish off and then hand rubbed several layers of tung oil over the entire piece. It is beautiful. Now, I think she wishes she hadn't given it to me. A Few Plans For The Rest Of The Week. 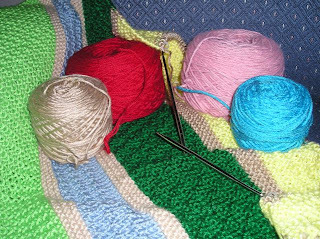 . . begin a rug, work on the two oddball blankets, mail the newsletter. You've got a lot of choices. on a regular basis, try another choice. 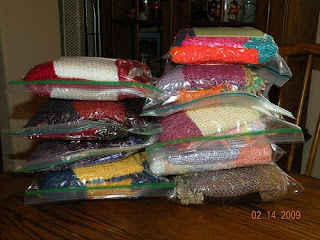 Stashbusters is a Yahoo Group that encourages members to limit the amount of fabric they purchase and use the fabric they have in their stash. 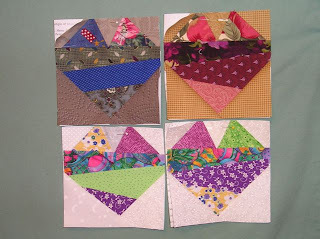 This month, the group started a Sampler Block Challenge. Everyone had to find an "ugly" fabric and use that in their Sampler Blocks that will be presented to the group in the next nine months. 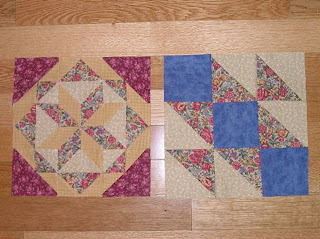 I made both blocks this afternoon. My finished blocks are not perfect by any means: my points do not match and the blocks are not the size they are supposed to be. I have tremendous respect and admiration for quilters who can make a perfect block with every seam matched. I have learned that I can strive for this goal, but I am not devastated when it does not happen. Crayon Box was finished Saturday night. 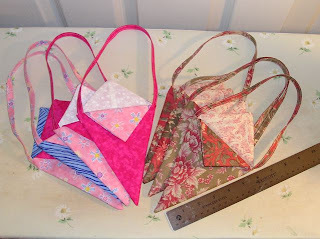 Yesterday, I made more items for the hospital auxiliary Valentine's Sale. I originally saw the pennie pockets here before Christmas, saved the pattern, but quickly forgot about them until I saw them mentioned again on Tipnut. Tipnut linked to the pattern on the Moda Bake Shop. The pattern is easy to follow and the pockets come together quickly. I was able to cut and make the eight pockets in two and a half hours with a couple of breaks to fill my mug with hot tea. I made a prototype to make sure I understood the pattern. The others were much easier to make. I am not a fan of yo-yos, so I will embellish the prairie points with buttons instead. For the sale, I will fill the bags with candy. **Tip** baste the prairie points across the cut edge to keep the edges even and to prevent migration once it is pinned on the pocket front. 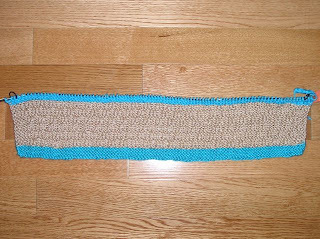 Monday afternoon, I started knitting an Oddball Baby Blanket, using scraps of Caron Simply Soft. 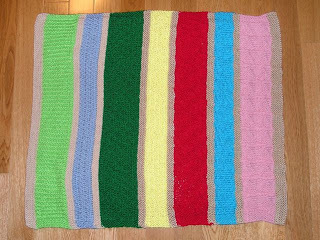 The blanket is named Crayon Box since the colors do not coordinate at all. I am knitting three ridges of garter stitch in a soft beige between each color to break up the contrast and to give the blanket more of a planned appearance. The color strips are not the same size because I am using scraps. 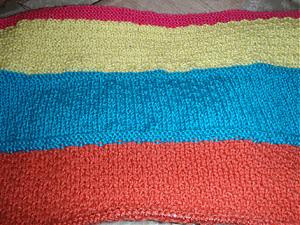 Changing colors is motivating me to keep knitting, and I am pleased with the progress. 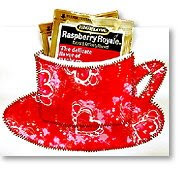 Want to share a cup of tea with a good friend this Valentine's Day even though she may be miles away? You might make some of these cards this weekend. I just found this link this morning and plan to see if I can get one or two made tomorrow. Sewing.org always has some good projects featured as well as sewing tips. Yesterday, I made some Valentine's Day cards for the hospital auxiliary sale. I got my inspiration for these cards from purlbee in this post. The cards shown in the post are nice, but I didn't think they would appeal to adults. I purchased some blank cards for an inkjet printer at the dollar store. The package contained six large cards, which I cut in half and sized to fit note card-sized envelopes that I had. 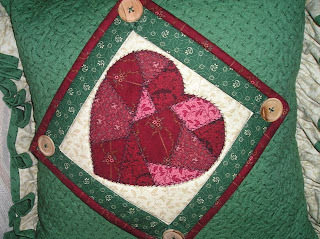 Next, I rummaged through my scrap bin and found some small waste blocks from my Duluth Stars quilt. 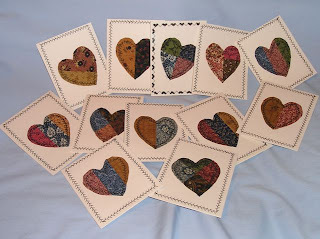 Once the hearts were traced on the blocks and cut out, I tacked them to the cards with a quick swipe of glue from a glue stick. The prototype was merely machine-basted to the card, but I didn't like it. 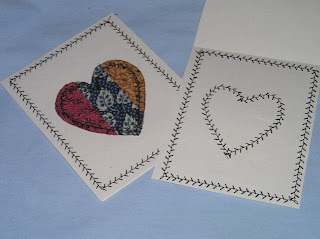 Then, I tried a decorative feather stitch, which added just enough formality to the card. The stitching even looks good on the inside of the card. The cards are blank on the inside. 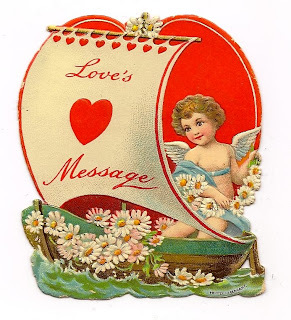 I think I will insert some suggested Valentine sentiments on a business card for those who need some inspiration. ** Note ** Make sure you check your bobbin before you begin and check it often because you do not want to have holes in the card. It is difficult to match the path of the needle on the decorative stitch. If I can find the right materials, I may make some of the Valentine pins also shown on the purlbee post. Our paths first crossed through providence. I strongly believe that statement because I cannot rationalize the events any other way. Even before we actually met, Lois was my Yarn Angel. In 2007, was at a local thrift shop casually looking in the yarn bin. The woman standing next to me (a stranger) asked what I was planning to make. I told her that I did a lot of charity knitting. She told me of a friend who was down-sizing and needed to get rid of some yarn and would I give her my contact information. I jotted down my number and address and promptly forgot about the encounter until bags of yarn began appearing on my doorstep. Yes, bags of yarn - garbage bags stuffed with full skeins and odd bits of baby and worsted weight yarn. Some of which can be seen here. 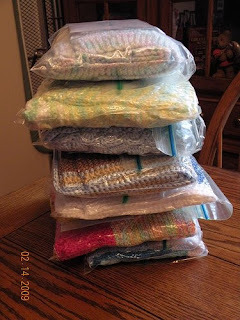 I kept much of the yarn but also shared some with a local Prayer Shawl ministry. I was thankful for Lois' gift, yet her generosity did not end with that first delivery. The yarn bags continued to appear. Fortunately one day, I was home when a delivery was made and met Lois, my Yarn Angel. At Christmas, I sent Lois photos of the items I made from the bounty: baby sweaters, baby hats, baby blankets, slippers and hats for the troops and homeless. 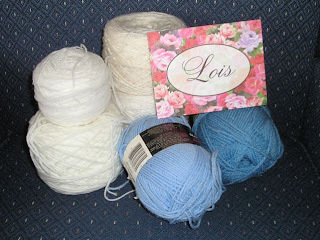 Thank you, Lois, and thank you, Lord for bringing Lois, my Yarn Angel, into my life.